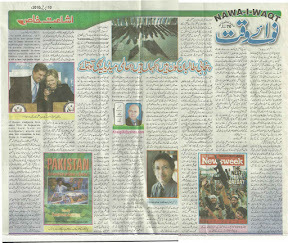 Truth by Kbaig: Who are Punjabi Taliban? Where are They? International Media Should Also Tell That...! Who are Punjabi Taliban? Where are They? International Media Should Also Tell That...! International media claims that their (Taliban’s) main targets are “civilized nations of Europe”. While according to India “the religious extremism in Pakistan which has now formed the shape of terrorism is the developmental phase of ‘TWO NATION theory which has only one target i.e. destroy Hindus.” While accusing like that international media doesn't consider the Jewish occupation of Palestine, protesting against which Palestinians first took placards in their hands, then stones and at least became suicide bombers. The journey of Palestinians from peaceful protest to suicide doesn’t consist of two or four years but of four decades. What else they can do? Their peaceful protests were shot, they were crushed mercilessly under the tanks, and their houses were converted into heap of scrap. 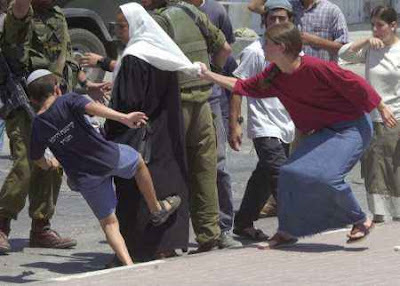 Their fourth generation which should have gone to schools is busy in stoning Israeli tanks with their young hands. They are neither afraid of Israeli fighter jets nor of cannons of Israeli tanks. If the data about the Palestinian martyrs and those whose houses have been destroyed is collected their number will not be less then population of civilized Europe’s many countries. While in central east the process of killing and destroying Palestinians has not yet stopped but it is going on. In the same way the ruler of India “Brahman” claims Muslim populated to be its part and murdering Muslims recklessly to crush their movement of freedom its right. When Kashmiri Muslims rejected to bow in front of torture and genocidal behavior of Muslims, as a natural reaction India started accusing freedom fighters as TERRORISTS and started a struggle to defame Pakistan as a terrorist state. And as per rules of “Chankiya” the propaganda started that Pakistan is backing up militants to destroy Muslim-Hindu brotherhood and peace of secular Hindu civilization. 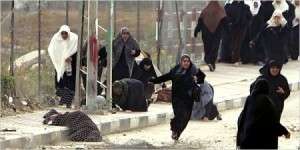 Running for their lives and crying for help... Palestinian Women! Look at the shame lessness of civilized nations and their media after their own people have sworn that the claims against Iraq and Afghanistan were nothing more then propaganda they doesn’t feel shame on the murder of 30 million Iraqis and afghans. 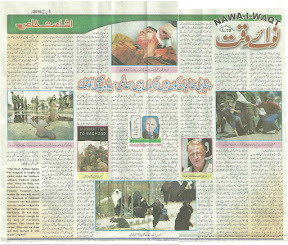 And now they have started a new propaganda of PUNJABI TALIBANS. It is just like that if Christians of America, Israel, UK, France, and Jews of Israel and Hindus of India have nuclear weapons it is Atom bomb while if Pakistan gets that weapons it is ISLAMIC bomb which is threat to other religions. So now that new term (Punjabi Taliban) is not a part of chain of their previous propaganda in which they have lick dust that due to increasing terrorism in Pakistan Pakistani nuclear weapons are unsafe and fall in the hands of terrorists and become a threat to whole world? No one asks them that who are Punjabi Taliban and where are they found? The sorrow is that the Modern Pakistanis in order to prove themselves as liberal, developed and civilized also support such fake claims. 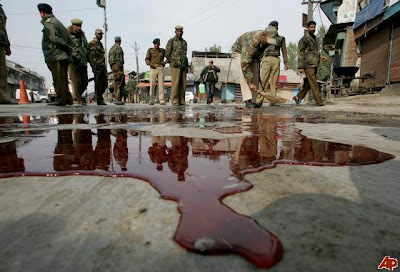 They don’t protest again the terrorism due to which the blood of Palestinians and kashmiris is flowing like water in the streets. They also don’t stand against uneven distribution of power and wealth. This is forcing poor classes to join terrorism in the hands of anti Islamic and enemies of Pakistan. What are the factors due to which the country is unable to come out of the darkness of the poverty in spite of having all the resources? That all isn’t known by our liberal and developed writers and intellectuals? 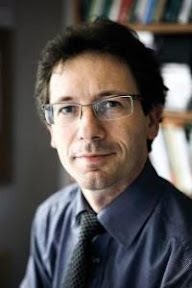 If liberalism is the answer to the wellbeing and continuity of humanity (which is defined so by our liberal writers) then who will be more liberal then Muslims of “Kosovo and Bosnia” who were modern. They didn’t have any link with religion. Neither had they known about SALAT nor about Fast. They didn’t know the Islamic culture. They had only one fault that they were off springs of Muslim families. What happened then? They were murdered, young girls were raped in camps till they got pregnant, and the tortures on Muslims of Yugoslavia are a slap to modern civilization. That can’t be ignored by any historian. After bearing such torture when they took weapons they were given the name of terrorists. On 9th April the person who blew up the building of FBI in Oklahoma wasn’t a Muslim or afghan or a Pakistani from Punjab. Timothy McVeigh was a strict Christian. He was angry over the rulers support for Israel and genocide of Muslims in Bosnia. By the bomb blast he shacked the American rulers. Then say him also a “Punjabi Taliban”. In the same way are the five American terrorists jailed in Sargodha belong to Punjab or Pakistan? Till the readers don’t examine these harsh facts they will not be able to reach to the depth of this conspiracy. That although the terrorists in Pakistan are Pakistanis but they have nothing to do with Islam. They all are a weapon in hands of enemies of Islam whoa are being used against Islam and Pakistan collectively by the name of Taliban to act as a fuel against attacks on Pak Army and security agencies. The person wearing suicide jacket and killing innocent citizens doesn’t know that what is he going to do. He thinks his act is a ticket to Janna(heaven) but he straightly goes to hell. However the persons who are training and brain washing him, their purposes have now been completely came to light. “The dead Taliban fighter wrapped in lengths of cloths, which the Northern Alliance Fighters ripped away. When the body was turned over, a cry went up, Punjabi, ‘Punjabi’- that meant the man was one of thousands of Pakistani volunteers who had poured over the border to fight for the Taliban and for Osama-Bin-Laden. He was dead but that hasn’t enough for the men of Northern Alliance, They kicked the corpse, they spat on them and they mocked it with Laughter”. Readers have hopefully read about the American (Published in newspapers) demand that “Govt. of Pakistan should take action against Punjabi Taliban present in Pakistan”. That demand was repeated by vice foreign minister for South Asia Robert Blake talking about India Pakistan relationships. Now the question is, are there in the whole Punjab caves, narrow mountains, passes like NWFP and Swat or hidden places where Punjabi Taliban hide and take part in terrorist activities in Afghanistan. The terrorists present in western areas are not indulged in fight with Americans but with Pak Army. Then why are Americans worried? If by Punjabi Taliban America means districts of Southern Punjab (which is actually towards it), then America should use term ‘Saraiki Taliban’ in spite of Punjabi Taliban. But doing so hurts the interest of enemies to criticize Punjab Province whose planning was made 5 decades ago. The term of Punjabi Taliban is a later term to be discussed. Today’s generation wants to know that who Taliban are. If they are terrorists then why are they called and written Taliban? And secondly why only security agencies of Pakistan are target of these suicide attacks? To get the answer of these questions we will have to look back at 90s. It is the 2nd era of Benazir Bhutto’s Govt. When American diplomat to Pakistan John C. Monjo and interior minister of Pakistan General Naseer-u-llah Babar are laying foundation of a movement named as Taliban with the help of two important religious personalities. 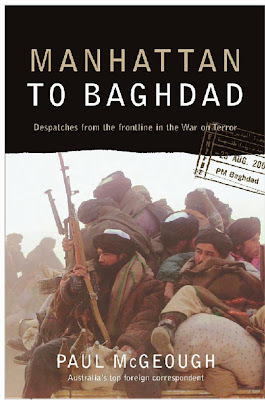 Before it CIA has been struggling for a safe American trade route from Kandahar to Harat. The beauty of these struggles is that in the name of peace formation all such activities were being conducted in those provinces of Afghanistan which were related to the trade route from Balochistan to Herat. In this scenario first of all General Rasheed Dostum was decided to be used but he proved to be more intelligent than Americans. He took finances from CIA, bought weapons for Uzbek militants and joined Mujahideen. In the 2nd try the friends of Zahir Shah from Qandahar to Herat, few Mullahs, Communist General Asmat-ul-Llah of Muslim militia, and some other war lords were united to capture and control the specific area of trade route. However intense differences among these groups made them disperse after fighting with each other. In the third try ex-army personnel of Afghanistan, and govt. employees (Communists) were merged in a movement, named as “Mazlumeen”. Their purpose was to restore peace in Afghanistan (if the mentioned movement had been successful there would have been no name of Taliban in the world). But due to the bad luck or inefficiency of Americans that struggle ended in vain. In the name of peace restoration the 4th try was formation of Taliban to protect American interest (What were American targets and whether Talibans achieved those targets for America? This is to be answered by Americans.). however the slogans prepared for this movement much praise from afghan public i.e. 1) The ex soldiers of afghan army from Khalaq Party who was communists ideologically and knew how to use light as well as heavy weapons. Moreover they were also trained about military rules and regulations. This group was led by General Tani ex-defense minister of Najeeb’s govt. who was successfully converted to American side by CIA before defeat of Russian army. The real role for American interests was to be played by this group. 2) Around five hundred groups of Pashto speaking afghan Mujahideen, who had no leader out of their group. They had joined Taliban to get free weapons, other benefits and for the imposition of Islamic. Some out of them belonged to Chechen, Tajik, Uzbek, and militants fighting with soviet forces who went to Afghanistan including Pakistanis (speaking all languages). 3) Keeping in view the interest of afghans for implementation of Islamic laws Americans decided to include students from two Pakistani madressahs(it included both who have completed their education and who were yet students). Due to them the American formulated organization was named as Taliban. Although they were not more then 20% of the whole movement. Afterwards why Taliban decided to leave American agenda and capture Kabul, in this process why America blames General Hameed Gul and why USA is against him? It is not our todays topic, however the brief introduction to taliban’s history was necessary cuase of people joining Taliban from 1993-94 included Tajek, Persian, Punjabi, Seraiki, Urdu, Pashto, Uzbek and Arabic had no name with in the organization on language basis. And both after Taliban captured Kabul and then got defeated there was any term of Pakhtoon, Arabic or Punjabi Taliban. After capture of Afghanistan by Northern Alliance due to the American support calling all Pakistanis as Punjabi Taliban, is due to the N.A’s deep relationships with India. This has made Punjab and link to Punjab an abuse by a planned conspiracy with the support of international media. Look at the history haven’t the separatists used Punjab as a weapon in Eastern Pakistan (now Bangladesh)? Which are the liberal nationalist parties of Pakistan outside Punjab which have defamed Punjab and Punjabis to prove their importance, are there links with India hidden? It is the result of the hatred produced against Punjab that we have accepted to live in dark and destroy economy and agriculture. But we are not ready to build Kala Bagh Dam because the plant producing electricity will be built in Punjab. Sindhis blame that Pakistan wants to ruin their lands; people of NWFP think Punjab wants to sink them, although engineers who prepared physibility report of the dam were all non-Punjabis. Today ask any dumb and illiterate and he will reply that the Kala Bagh was rejected only and only for Indian benefit. “In Pakistan, army, establishment, federal and provincial jobs, education and health all institutes are controlled by Punjabis, who are not ready to accept anyone else’s govt. and control. These are Punjabis who made Bangalis to get separation and now other provinces are moving on the same way.” Here it is not possible to cover the whole book here, but I think the purpose of publication of this book is to support militants backed by RAW, CIA and MOSSAD. To make terrorists activities of these militants and attacks on non Balochs acceptable on international level, which are still continued. 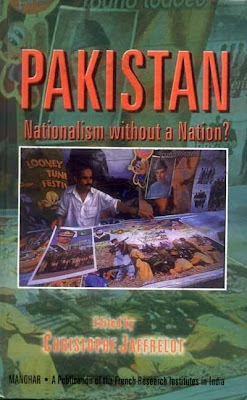 A Book Full of Propaganda Against Pakistani Province "Punjab"
Title reads, “The next Alqaeda”, sub heading reads, ‘The terrorists who attacked Mumbai are looking forward for west. Under the picture in a small caption Lahkar-e-Taiba is mentioned. In this way forget about the poisonous story inside the digest the title page itself is a full essay. Through one picture developed nations of west have been given many messages. First of all a question is raised that who is after Alqaeda? Then the answer is provided, that the same who attacked Mumbai and now they are preparing to attack west. Beneath as Pakistani organizations Lashkar-e-Taiba and other are mentioned. Lashakar-e-Taiba and others have centers in Punjab too, who was to be attacked in a surgical strike by Indian air-force on 27th November 2008. had the Indian govt. got proofs just in 12 hours that the persons who attacked hotels in Mumbai belong to the Lashkar-e-Taiba fighting in Kashmir? 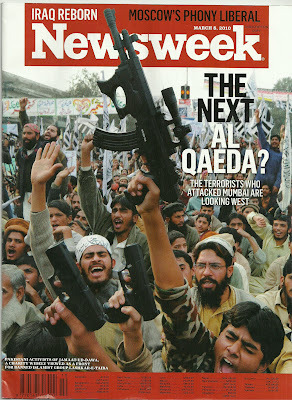 And have Indians provided proof to American weekly NewsWeek that the attackers of Mumbai are now planning to attack Europe? Just for that in the deadly drama of 60 hours some European and Americans were also killed? Wow, what a beautiful script written by New Week and its Jewish reporter “Jeremy Kehn”. However its Hindu photographer ‘Sanjeet Daas’ and editor forget that the Kalashnikov like gun shown is a toy sub-machine. Look at the opening of Kohn’s article’s opening which was told by an important American officer that very less things in life has worried him and one of them is the capacity of Lashkar-e-Taiba to conduct terrorism. 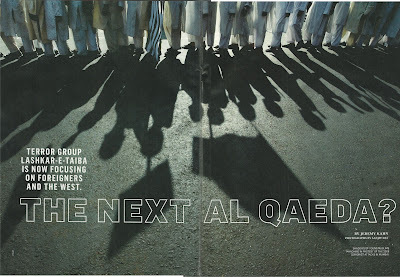 Is really Lashkar-e-Taiba more dangerous than ALqaeda? Is it active in Iraq, Bangladesh, and Afghanistan and European countries? So much lie! Curse on such journalism which is focused on misguiding the world. It was much better if western media has openly demanded action against Lashkar-e-Taiba to make India happy. Maybe they think they can better fool the world by using term “Punjabi Taliban”. So that on one hand their agents keep on targeting Pakistani security forces and on the other hand they can target Punjab by drone attacks as they do in tribal areas. So that they can fulfill their own purpose and support their new ally India. 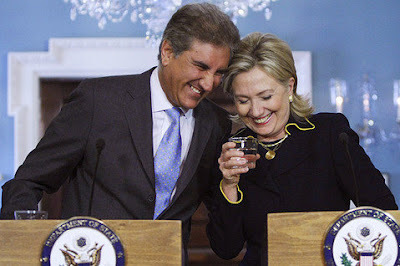 Why this happiness is not being transferred to faces of Pakistani people?